As part of the ‘BNP Paribas pour l’Art’ (BNP Paribas for Art) programme, which celebrates its 20th anniversary this year, the BNP Paribas Foundation and BNP Paribas Japan have signed a Corporate Philanthropy agreement with the Ohara Museum of Art for the restoration of the oil-on-canvas work ‘Avant le bal’ (Before the Ball) by Léonard Tsuguharu Foujita. Founded in 1930 by the businessman Magosaburo Ohara, the Ohara Museum of Art in the Japanese town of Kurashiki holds a major collection of European masterpieces by such artists as El Greco, Gauguin, Monet and Matisse, including ‘Avant le bal’, which Foujita painted in 1925 and which the museum acquired in 1957. 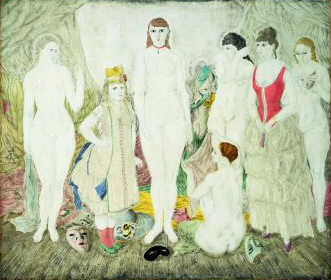 When it was first shown, Foujita’s painting ‘Avant le bal’ was hailed both for its harmony and the painter’s ‘Nyuhakushoku’ (chalk-white) technique, details of which he kept a closely-guarded secret. Basically he painted the background with white mother-of-pearl powder and then painted on top in Sumi-e ink from inksticks. Foujita was very fond of this particular painting and kept it for several years. At the centre we see Foujita’s wife, Lucie Badoud, whom he nicknamed Yuki – ‘Snow’ in Japanese – because of her very white skin tone. The shorter woman on her left is Marie Vassiliev, a noted Russian painter living in Paris, France. Having been regularly on show at the Ohara Museum as part of its permanent collection, the painting is now in need of professional work to restore its colours to their former glory. A major exhibition in Kyoto and Tokyo is scheduled for 2018 to mark the 50th anniversary of the painter’s death. Once ‘Avant le bal’ has undergone restoration work at the workshops of the Tokyo University of the Arts, it will be at its brilliant best in time to go on show at the exhibition. Fujita Tsuguharu, who went under the name Léonard Foujita in France, became a well-known figure in the Montparnasse district of Paris in the 1920s. The scion of a highly cultured Japanese family which was very open to new Western ideas, he began learning French at primary school and then studied Western art, graduating in 1910 from what is now the Tokyo University of the Arts. In 1913 he moved to Montparnasse, where he discovered the work of Picasso and Henri Rousseau, and ‘hung out’ with such literary and artistic luminaries as Guillaume Apollinaire, George Braque, Fernand Léger and Kees Van Dongen. He was soon co-opted by the painters of the ‘Paris School’, of which he became a member. He forged his own highly personal style, applying Asian artistic techniques to Western-style painting. Foujita became famous for his highly intimate subjects: women, young girls, cats, self-portraits and religious scenes. Launched in 2009, BNP Paribas in Japan is a sponsor of the Tokyo Photo art fair. It is Japan’s first international art fair dedicated to photography and has quickly established itself as a major cultural event in Asia. The fair has collaborated with leading art institutions of the world including London’s Tate Modern and the Museum of Photographic Arts in San Diego. It aims to enrich and energise the cultural landscape of Tokyo through the promotion, understanding and appreciation of visual arts. The Women Changing India project is an initiative launched by BNP Paribas in 2010 to commemorate the 150 year anniversary of operations in India. Since 2010, the exhibition has toured eight Indian cities and major galleries in Paris, Milan, London, Brussels and St. Tropez. The exhibition held in March 2013 at the India Cultural Centre, Embassy of India, Tokyo marked the first time for the exhibition to be held in East Asia. This project combined the talents of Magnum Photo Agency and Zubaan, a Delhi-based publishing house specialising in books for and about women in South Asia. Six subjects were identified to highlight the cultural and geographical diversity of women’s lives in India. Each subject aimed to highlight the changing roles, aspirations, opportunities and challenges that Indian women face, whether they live in villages or cities, whether they are students, taxi drivers, lawyers, movie directors or business leaders. These were covered by six well-known Magnum photographers: Martine Franck, Alex Webb, Patrick Zachmann, Alessandra Sanguinetti, Olivia Arthur, and Raghu Rai and the photographs focus on the vital role that women play in India today.